Hallelujah and hot damn-we made it alive with the car in one piece back to Dublin after our road trip across Ireland. Not that Thom isn’t a great driver but all roads except the motorway are teeny tiny lanes and frightening not to mention the whole driving on the wrong side of the road. Left, left, left. Yesterday, we reached an impasse, going head-to-head with a taxi driver on such a road and he won with Thom having to back up along with the car behind us until we could find a place on the side of the road to pull over so he could pass. Fecking mental I tell you! Yes, that’s my favorite Irish phrase now. I heard a youth on the street say it and it reminded me of Ron Weasley in an Irish way. Now back in Dublin after chasing the rain storms all the way from Galway, we immediately checked back into the Westin Dublin and off we went. One minute it was sunny and the next raining, very much reminiscent of Seattle weather. After an Irish coffee and the ploughman’s sandwich for me and the bangers and mash for Thom, we were suitably energized to walk to Merrien Park again so that Thom could take more photos of the beautiful Irish doors on the townhouses across from the park . We wandered the neighborhoods where the fancy townhouses are home to the France Embassy, a Montessori School and private residences. In one section of the park, there were tributes to author Oscar Wilde who lived around the corner while in Dublin. Sent to jail in the UK for being gay, he never returned to Ireland after serving two years in jail and died in France at age 46. His most notable works were The Importance of Being Earnest and The Picture of Dorian Gray. The Irish are very proud of their literary history. Our cab driver told us his family story of 5 children and 9 grandkids. Proud of them all, he bemoaned that fact that none of the children every married and one of his daughter’s significant other was in prison for a “very bad” crime. Quoting Yates, “Youth is wasted on the young”, he discussed being a parent and loving your children no matter what life brings, hoping only for the best for them all. Amen. Of course, there were many fine buskers performing in the streets and we stopped along with crowds of others on Grafton Street to listen and appreciate their talents. We finished up some last minute shopping, going back to the vintage shop we had found earlier and visiting the classic whiskey store for some liquid souvenirs. I’m always impressed by the art pieces in front of the Irish stores, making them very special and unique. Now, it’s time for a rest before the long journey home. It was a brilliant trip that we will never forget! Today we ventured down the cow path and into town. As we started to exit the hobbit hole, we paused as two very large black cows stormed down the “road” with their humans herding them into the adjacent field. So, exactly what do we do if we encounter this type of situation again but we are driving? Scream and brace for impact probably. Luckily, we swerved around any oncoming traffic and made it safely into the town of Galway, very photogenic and historic. After maneuvering into the always tiny parking spaces in the garage (our Audi is larger than most cars here), we wandered the streets where pubs and shops welcomed us. First stop was for an Americano as there is only a hot water pot for tea in our cottage and no coffee except instant Nescafe available. Caffeine headache averted, we found the shops to be charming and loaded with nice things for presents to others and ourselves. The best by far was the “My Shop…granny likes it” (www.myshopgranny.com) that had a curated assortment of all things Irish and cool, not touristy crap. I immediately was drawn to an amazing chunky necklace made with blue and yellow stones. Had. To. Have. It. After chatting with the shop owner and her adorable schnauzer, Purdy, the shop dog, we also got a great pillow cover, which I collect from our travels and tea towels featuring an abstract print of the charming Galway row houses and another boldly proclaims an old Irish saying, “FECK IT…sure IT’S GRAND” Okay. Always ask the locals where they eat to get the best places. Rona O’Reilly recommended a funky place just down the lane called Bite Club which had free WiFi, played disco tunes and had great food. Ryan and Paddy took care of us and we chatted. Ryan was mad at Paddy because he had saved his money and was off to America to visit any and all relatives he could find from coast to coast. Paddy mixed me up a mean craft cocktail, Elderberry Bourbon Fizz, served in a crystal punch cup. Delightful! After singing along with Donna Summers and posting some blogs on the internet (the hobbit hole is without tv/internet), we were off for more browsing and shopping before braving the drive home via cow path. If the driving over here wasn’t so nuts, we’d be back at the Bite Club in the evening when it turns into a 1980’s discotheque. Groovy. “We’re taking country roads” Thom was in charge of mapping our adventure driving from Limerick to Galway via small hamlets where his Irish relatives were born. Cool, an adventure driving through the Irish countryside. Right? Wrong! Little did I realize that this would mean taking what amounted to a cow path (and I’m being generous) for miles, avoiding head-on collisions only by luck and chance and several turnouts we took full advantage of when faced with another vehicle using the single lane. They call this a “road” in Ireland. It’s a cow path. Just to give you an idea of how tight it was, even when not trying to avoid oncoming traffic, the blackberry brambles made some significant scratches on the Audi side mirrors as the wall of vegetation on either side of the path left no room for a normal size vehicle. Here’s hoping the rental car company doesn’t examine our car upon returning to Dublin. And speaking of cow paths, may I say that some of the cows we saw in this bucolic Irish countryside, when I didn’t have my eyes closed praying we would live to see another day, were HUMONGOUS, as my granddaughter Mia would say. I’m talking mutant big heads that had bodies so large they probably wouldn’t even fit down this cow path we were driving on. Back to the cow path experience-after we drove through one of the birth towns of a relative and stopping at the local church to take pictures, I cracked open the wine and proceeded to make good use of the flask I had brought with me for just such an occasion. After a few hearty sips, we hit the road again and I begged Thom to give up the next remote location and hit the motorway. Even driving on the wrong side, I mean left side, of the road was nothing compared to the one lane fright so he agreed to hit the motorway and we proceeded to find our home for the next three nights, a thatched roof ARBNB cottage near Galway. Greeting us with the fire ready to start and homebaked Irish soda bread, our host wished a quiet and restful vacation without TV or internet to distract us. Ahhhhh…..feet up, blanket on and fire lit. Heaven. Barak Obama car plaza near Tipperary, between Dublin and Limerick on motorway. I guess he has relatives here and has been honored with a gas station named after him. I am sure he is thrilled to celebrate his Irish heritage with this useful store vs. a museum or other nonsense. Seen as we entered the motorway on big reader board: “Project Edward Day” sign, which is acronym that means European Day Without A Road Death, with current tally at “0”, which will hopefully stay that way with us driving on the wrong side of the road, I mean: Left, left, left. No fancy cars, no trucks, no SUV’s or mini vans. Just standard manual transportation to get you where you need to be. Lots of dents and scrapes on cars and no wonder because everywhere but the motorway, the roads are just too damn narrow. SOS boxes on the side of the road. What? Not everybody has global cell coverage?? Shoe repair/locksmiths everywhere as well as tailors, signaling a culture that repairs vs. disposes of their wardrobe. Bookstores-small independents-also on every street but not big chains and mostly featuring Irish authors vs. worldwide blockbusters. Newspapers, they are still relevant here with multiple different papers offered in all the grocery and book stores for your reading enjoyment. Love it as we still enjoy a daily newspaper delivered to our door in the States but we are the only ones in our building to do so probably because we are also the oldest residents as well. Blah. Resale/consignment/vintage stores are plentiful. Thrifty and trendy at the same time. We stopped by the Salvation Army one and browsed the wide selection of clothes, housewares and some vinyl. One small gallery of shops had not only a great vinyl shop but a vintage clothing store and a variety of stalls selling everything from nuts to posters. Love places like this! Gyms are few and far between with the main sport being lifting a pint. Irish excel at that sport. True-I’ve been to many a pub on this trip and witnessed this sport first hand. Knobs and Knockers was one of the best titled stores, selling, you guessed it, just door knockers and door knobs. The doors of Ireland are beautiful and a subject of many photographs. Thom told me a red door means the house is paid off. Now when I see a red door, I’m thinking to myself, “well done” to the occupants and enjoy no more mortgage payments. Travel agencies are still around and, based on the number of them, I would say fairly popular. Thinking the “seasoned” generation is not tech savvy and needs assistance scoring a ticket or reservation. Grocery shopping with the locals is always a great way to understand a culture. At Aldi’s, there were literally bulk stacks of meringue circles. In the bread aisle, always a huge focus here where carbs rule, there were packages of pancakes and waffles in with all the other items we would normally see. The cakes/buns/jelly roll selection was wide and varied. Tea time! Beside a stack of goose fat jars, you could also find baked beans in ready-to-go single service packs. Yum. Irish yogurt is tasty and comes in tiny glass jars. Cute. In many groceries, there are loaves of bread, scones, etc. heaped in open air baskets. Kind of yucky to us uptight Americans who are used to everything being covered up or behind the counter vs. everyone can touch and feel and explore the pastries with their grubby, germ-infested hands. No thank you. Smoking restrictions inside pubs are more of a “guideline” with many drinkers huddled outside around barrels and on adjacent outdoor patios enjoying a pint and a puff. No restrictions here about staying 25 feet away from the building to inhale carcinogens. That would be very inconvenient for the pub staff to service the refills. 300,000 people attending the Ploughman Competition outside Dublin where they do farm games. Headlines daily in the newspapers-big deal here. Sheep are sometimes spray painted blue or green or yellow. What. The. Hell. Hen Parties for bridal parties and Stag Parties for the guys are HUGE in Galway. 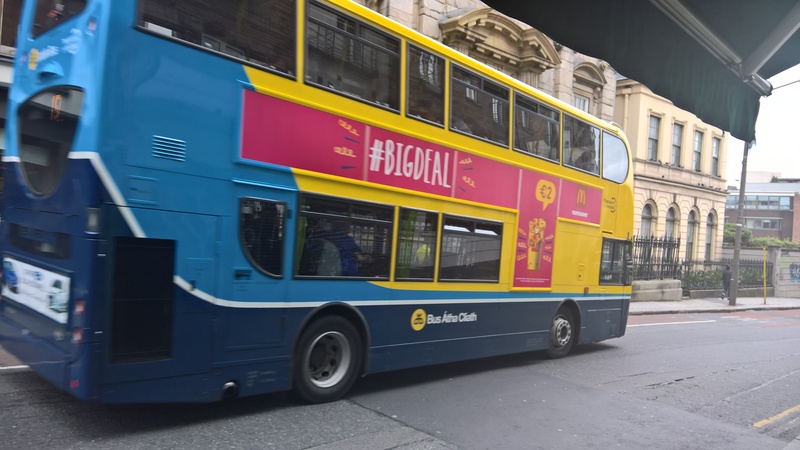 There is a two day bus/rail strike planned for Thursday/Friday. Thank goodness we have a car and aren’t reliant on public transportation as we usually are when we travel. Then on Saturday there is a huge “Repeal” protest in Dublin to protest the strict abortion laws. Thom usually attracts protests so surprised we won’t be there for it. In this very Catholic country, they are fighting with the church which never goes well. By chance or perhaps an ancient ancestor guided our lodging choices, but either way, we stayed at the Absolute Hotel on St. Harry’s Mall Road on the river. With outstanding views and friendly service, the location was perfect because Thom’s grandmother lived directly across the street in the early 1900’s before coming to America. His grandfather, Patrick O’Dwyer, rowed at the Athlunkard Rowing Club during this same time. Stopping by, kind gent John who is renovating the very neglected rowing facility, let Thom go through plastic bins of old pictures looking for Patrick. He found him! 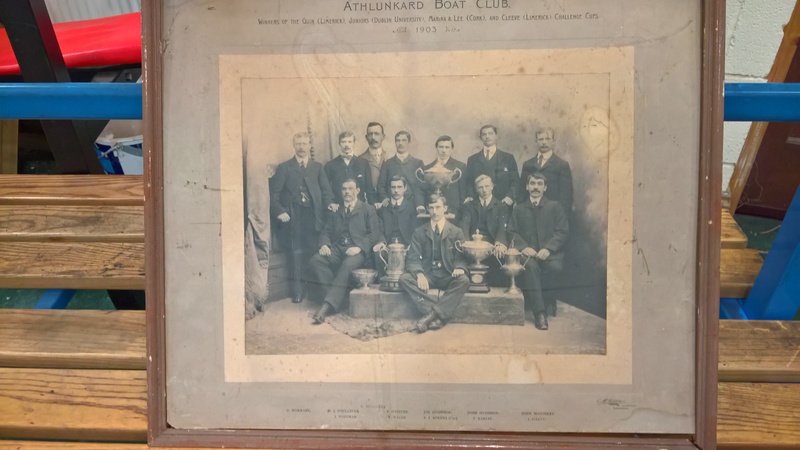 1903 was a very good rowing year for Patrick and the club, winning 5 awards. Thom was thrilled to find Patrick and his team pictured with their trophies. Hopefully, the club will preserve these crumbling photo galleries for posterity. Also in the Medieval Quarter, St. Mary’s Parish is where Thom’s grandparents were baptized and his great grandparents were married. After talking to the church administrator to get some ancestry paperwork for a possible Irish citizenship for Thom, we imagined his grandparents’ life living across the street, rowing at the nearby club and what that might have felt like. There is also a St. Mary’s Cathedral down the street which is much grander and worth a look as well. With a break in the rain, we walked the waterfront past King John’s Castle, which was neglected in the past and, in the 1950’s, was the site for a public housing project but it has now been renovated and is a big tourist draw for Limerick. It was early morning when we did our adventure around town so unfortunately we didn’t go inside but crossed the Thomand Bridge past the Treaty Stone and along Clancy Street all the way to the Sarsfield Bridge and into town where you’ll likely see many a modern store next to a medieval stone arch. In the midst of all the pubs and shops is the quaint St. John’s church with a cemetery that is showing signs of neglect but is awash in history. After reading some tomb stones, we got just a little bit lost but eventually headed in the right direction to our hotel. Along the way, we discovered the Milk Market which unfortunately wasn’t open during the week when we visited but it looks like it would be worth a look if you visit on Saturday or Sunday with food and local artisans showing their wares under the big white tent. The previous night we were lucky to meet up with Thom’s Irish family, connecting for the first time, exchanging photographs and family stories. It was lovely to meet everyone and we plan to stay in touch via social media. Thom and I hope to bring our whole family over for a proper Irish reunion in the future. The river that Thom’s grandfather, Patrick O’Dwyer, rowed on. “Where can I find a REAL Irish pub?” I asked the vinyl shopkeeper in Dublin. “You mean one without tourists who believe in fauking leprechaun and want to see River Dancers?” he replied with disdain for tourists. I get it and appreciated his predicament. He probably relied on the stinking tourists to make a living but hated their ignorance of true Irish history and culture. After some discussion with he and a customer who was trying to be helpful, we had some recommendations and were ready to experience real Irish food and music. First, we walked to O’Donoghue’s where Glen Hansard, our Irish singer we love, frequents when in town but it was early and not too much was happening so on we walked. As usual, we then wandered into a beautiful local park, which we wouldn’t have normally sought out. A big event was going on with entertainment and music but unfortunately it was sold out and we couldn’t talk our way in but we still had a lovely time seeing how the locals used their parks with jugglers juggling and groups of people doing yoga together on this lovely late summer evening. We had stumbled into Merrion Square, which had been a private park for the rich surrounded by townhomes and is now a public area to be enjoyed by all. Needing substance, we sought out a pub that I had researched in advance, The Old Storehouse, which did not disappoint with hearty shepherd’s pie for Thom to pack away. After asking the waitress for an Old Fashioned, she asked how I wanted it made. I wanted to give a smart reply like, “If I need to make it or tell you how to make it then why do you have a bartender?” but didn’t want her to spit in my drink so I just replied nicely that whatever way they normally made it would be fine by me. Ha! I received a shot of whiskey (and not a generous one) with orange peel. You would have thought I might learn from that experience but, no, not really. After Thom astounded me with his knowledge of Irish pub songs (which he learned from hanging out in NYC Irish bars since he was a wee lad), we sang along to Molly Malone and other Irish pub standards as well as American classics. Looking for more real Irish music since the singer at The Old Storehouse ended his set with John Denver, we decided to go with Thom’s brother Pat’s suggestion of the self-proclaimed oldest pub in Ireland, The Brazen Head, estd. 1198. 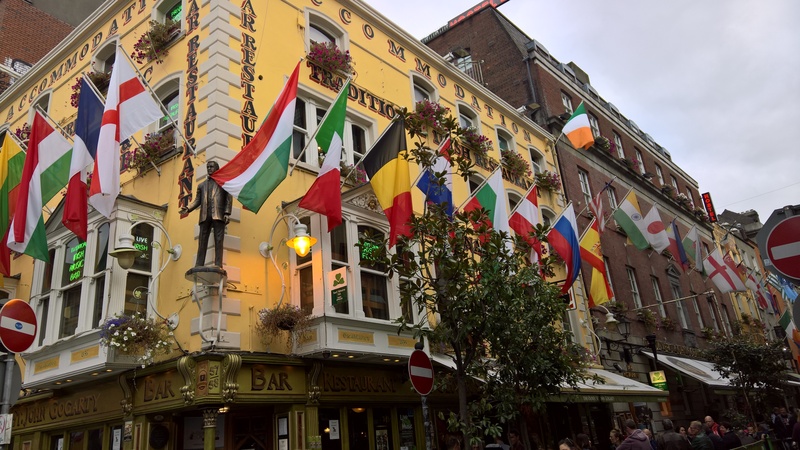 Now, it is WAY off the beaten path and quite the walk from Temple Bar area but off we continued until finally finding it. Sharing tables with two gals from Germany, the place was packed and authentic. I felt sorry for the Asian tourists in the corner who were huddled up with strangers and looking very uncomfortable sharing space. I gave up my seat so an elder couple could sit together and I stood at the bar. Got to give it to the seventy-something with a cane venturing out to the pub still to enjoy the music. He deserved a stool. I sidled up to the busy bar to order a coke for Thom and an Old Fashioned for me to compare with the previous one. “We don’t do cocktails.” The bartender sneered at me and then ignored me. Okay. Should have known better. My bad. “Shot of whiskey and side of water” was better and I was rewarded with a tiny amount of whiskey and a water I would share with Thom. We were there for the Irish music not the spirits, so all good. Smoking outside the bars and in outside patio areas is common. One guy lit up a cigar and you could smell it all the way inside. I sneered at him on the way out. Didn’t faze him at all and he puffed away, sharing his stench with everyone in and around the pub. Classy. Cheers.